Game Of Thrones Inspired Earrings - Three Headed Dragon - Song of Ice and Fire Vintage Targaryen Khalesi's Dragons Perfect Gift for any GOT fan! Beautiful Game of Thrones Inspired Earrings. 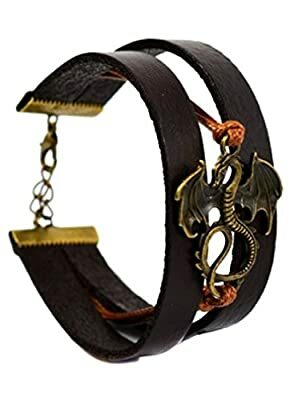 The three headed dragon eating his tail represent the three dragons raised by Queen Khalesi. Great gift idea for any GOT lover! Dimensions: 4 x 4 cm Included in the price: 2 x Earrings 1 x FREE Organza Gift Bag About Beaux Bijoux Beaux Bijoux is an independent jewellery store that pride itself in offering guilt-free prices for stylish fashion jewellery, novelty / cosplay accessories and TV inspired jewels. Necklaces, bracelets, cufflinks and earrings are all featured on our shop, as we aim to provide a wide range of choices for women, men and even children. Browse through our Amazon e-shop to find items that can make a statement, add personality to basic outfits or make the perfect gift for a loved one! Changed your mind or you are unhappy with what your bought? Shop with confidence knowing that we have a 100% money back guarantee policy if you are not 100% satisfied with your order! Feel free to CONTACT US for any reason, at any given time! ADD TO CART TODAY AND START ENJOYING IT TOMORROW!